After more than 60 years, May 29th 1953 remains the most important date in mountaineering history – at 11:30 AM, Tenzing Norgay and Edmund Hillary became the first people to successfully reach the summit of Mount Everest, the highest point on earth. Many before them had failed; some had even died in their attempt. The story of this accomplishment is one of meticulous planning, seamless execution, and most importantly a well matched expedition team of strong and collaborative climbing partners. Any Partnership is very much like an exploratory expedition, and successful ones bear the characteristics demonstrated in that first Everest ascent. A team was built for conquering a singular goal with many unknowns and a wide range of possible outcomes. In the case of that expedition, army colonel John Hunt was recruited as leader, and like in other partnerships, his job was to lead in the preparation, execution, achievement of a defined goal, and getting his team home safely. At Constellate, we consider these as steps within the “partnership cycle”, which we will explore here in more detail. Summiting: Reaching the Summit is critical, but it sometimes needs to be put in perspective. The most important part of an expedition is ultimately the Safe Return, in which partners ensure that they finish the journey stronger and wiser than when they started. In between each of these stages are Enablers that allow the Partnership to grow from one stage to the next. These can be seen in the connecting arrows below. The life of a partnership starts well before a signed agreement, and there is a significant amount of thinking that goes into forming a partnership before the first potential partners should be contacted. In mountaineering, planning and preparation will start months and sometimes years in advance. It is critical to invest the time and effort to have clear strategic intent for a partnership, which will set you up for everything that follows. 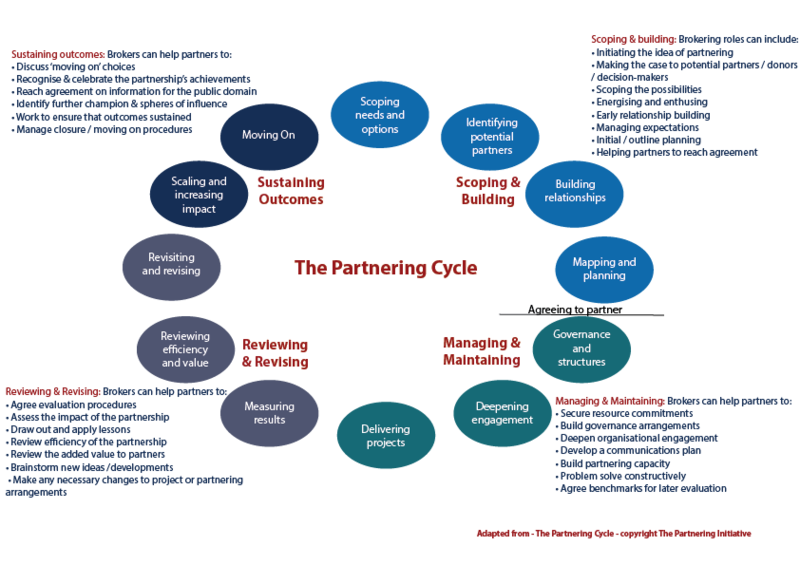 Mapping: Mapping a partnership is perhaps the most critical step to the ultimate success of a partnership. Long before setting off, most expeditions start with many evenings poring over maps and thinking of possible objectives and ways to meet them. These decisions will be taken with a balanced view of risk, so that they bring the thrills of an adventure, but still present a calculated chance of success. Before assembling a team and finding partners, it is essential to understand the scale and scope of the objective. The same is true of a partnership, in which it is important to understand what success looks like and what you bring to the partnership before lining up partners and signing an agreement. Engaging: In an expedition, headaches can be avoided – and the chances of success increased – by assembling the right team with the right skill sets and compatible personalities. The same is true in a partnership, and it is important to recognize that the best project managers may not be the best partnership managers. To engage successfully in a partnership, it is important to understand the perspectives of others, so not only is multi-stakeholder experience an asset, but “soft” skills like empathy allow partners to understand different perspectives. After the right partners with complimentary resources and skills are engaged, the next step is to establish the right systems for communication, governance and accountability. In any successful multi-stakeholder partnership, it is critical that decision-making and accountability are shared across the partners with a sense of equity. A partnership lead may choose their desired partners, but it is equally important that these partners see the benefits of engaging. For this reason, objectives must be refined and agreed upon with all partners engaged. If one partner has full discretion to make unilateral decisions, there is no shared decision-making, and therefore it is not a true partnership. During the adventure phase of an expedition, it is important to track and measure progress, and equally important to check the maps and make course corrections as appropriate. Sometimes unforeseen obstacles will arise, and the team members must step back and reconsider whether a new course may be necessary to achieve the goals set out. Launching: In this phase of a partnership, resources are mobilized and the partnership enters its execution phase. It is critical here to remember that these resources include much more than funding, as different partners will be contributing knowledge, expertise, contacts, products and physical resources. This is also when communications strategies, governance structures and accountability systems are put to the test. As the project team is distributed across different partner organizations, the tools used for day-to-day project management, communications and information flow must be shared across organizational boundaries. Check in: Checking in to assess the progress of a partnership is critical so that outputs and impact can be quantified. As with any other project, it is important to consider how progress will be measured, and for a partnership, this is true for qualitative as well as quantitative metrics. It is important to assess the health of the partnership as well: How well are partnership members communicating? How healthy is the team dynamic? Are there any underlying tensions? Are the governance structures working well? Correct: Answers to these questions may require course corrections, small tweaks in the way the partnership is running to allow for more efficient and more effective operation. These course corrections and adjustments will provide feedback loops for the management of the partnership, allowing for continuous improvement throughout the adventure phase. A partnership is not yet finished and not necessarily successful just because it has achieved its stated objectives. Before Hillary and Tenzin reached the summit of Everest, there were others who got close. In 1924 George Mallory and Andrew Irvine were last seen still going strong at the Second Step (about 28,140 – 28,300 ft). Many people still wonder if Mallory and Irvine might have been the first to make it to the top of Mount Everest, but as they never made it back down the mountain alive, their potential success remains a mystery. A “safe return” can mean a number of things, depending on the planning and delivery of a partnership. It may be that the partnership was designed to last for a fixed time period and has a sunset clause, which dictates that it is wound down and closed. It is also possible that a partnership has an option to be renewed and therefore is extended, scaled up or replicated. If the partnership is to be continued, it may do so under the same circumstances, or it may be more formalized and even spun out into a new entity or organization. Regardless of how one thinks about the future of a partnership after it has achieved its stated objectives, it is important to think through the full partnership cycle up front, and ensure that there is a plan (and the resources) to get home safely after the summit has been achieved. Part of this process will be a final evaluation of the partnership itself. At the partnership level: Was it a success on all levels? Did it deliver on time and within budget? Are all partners still healthily engaged? Was there collateral damage to one or more of the partner organizations? Would you repeat this expedition with the same partners? With different ones? At the organizational level: What was gained for the organization? What was learned by the organization? How will this learning be used to make future partnerships more successful? At the individual level: How did each team member contribute to the success of failure of the partnership? How can they be encouraged to reflect on their learnings from the partnership? Just as with a mountaineering expedition, the surest sign of success is not just whether a summit has been reached, but also whether the expedition members would join together as a team to explore other objectives. This is the real difference between a successful partnership built on relationships, and a successful project built on transactional goals. If we wish to embrace transformational partnerships, it will be the partnerships rather than the projects that will make the difference. There are many versions of the Partnership Cycle out there. The Partnership Brokers Association uses a 12 step cycle (http://partnershipbrokers.org/w/wp-content/uploads/2010/07/PC-Broker-roles.png), while The Partnering Initiative uses a similar 12 steps laid out a bit differently (http://thepartneringinitiative.org/about-us/philosophy-and-approach/the-partnering-cycle-and-partnering-principles/). Others, such at the World Bank (http://documents.worldbank.org/curated/en/2005/01/5846691/logframe-handbook-logical-framework-approach-project-cycle-management) and the ADB (http://www.adb.org/projects/cycle) only refer to project cycles rather than partnership cycles.